Do you always seem to go along with what other people want? Do you frequently find yourself trying to make other people happy and avoid upsetting them? Do you try to be nice in order to avoid conflict? Are you afraid to assert yourself or set limits when other people are hurting you? Do you feel as though you have to take care of other people’s feelings, but no one seems to care about yours? Do you have a hard time saying no when someone asks you to do something? If you answered yes to some of these questions, you are one of the many people struggling with the People-Pleasing Pattern. Of course, it is a good thing to be kind and helpful to people and make them feel good, but maybe you go overboard in this direction. You may find it hard to speak your mind, to say what you want, to say no, or to advocate for what you believe in. You may find it difficult to even know what you want or feel because you are so focused on other people’s needs and feelings. If you are tired of this pattern and would like to make a change, A Pleaser No Longer is for you. It will help you understand the fears and needs that are behind your People Pleasing. These fears are usually unconscious and come from unresolved childhood pain. 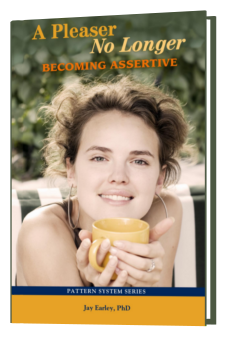 This book will help you to work through your fears so you can learn to assert yourself. It will help you set up a practice for letting go of people pleasing and becoming assertive and strong. You will also be able to assert yourself to meet your larger goals to advance your life. And you will have the personal power to advocate for others, to work against injustice, and to make good things happen around you. This doesn’t mean that you will become pushy or demanding. It doesn’t mean that you will stop caring about other people and wanting the best for them. However, you won’t be doing this from a place of fear or need; it will come purely from a loving place in you. And you will also be taking care of your needs. You will develop the strength and personal power to get what you want in life and to make the world a better place while continuing to be a kind and loving person. To say I am familiar with people pleasing thoughts and behaviors is an understatement. I live and breathe them. Even after years of work on myself and improvement, this pattern still operates in me. And in my role as therapist, I see this behavior in my clients daily. This is why I am grateful to Jay Earley for not only this book but the new series of ebooks, workbooks, and the online community with a buddy system to support you while you wrestle with the issues. What I find most helpful about the book is the directness and practical applicability of this new format. It goes straight to the heart of the matter and asks important questions about the subconscious patterns that are keeping you hooked to pleasing.